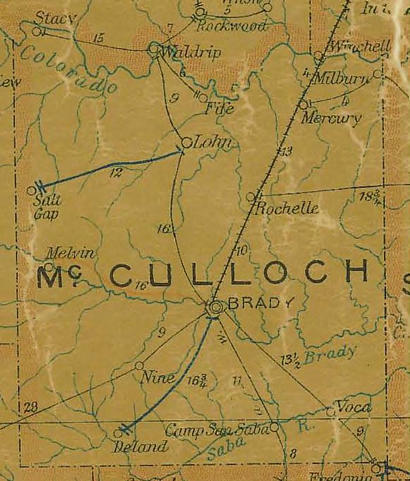 Calf Creek, Texas, McCulloch County. The most famous reference to Calf Creek is for a battle fought in 1831. James Bowie, and ten of his closest friends fought a combined force of Caddo and Lipan Indians along the creek. Estimates vary from 150 to 800 Indians. A nearby historical marker tells the whole story. 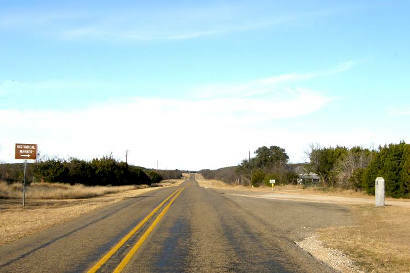 The community is, of course, named after the creek (that runs from 10 miles NE of Menard until it joins the San Saba River in NW Mason County). This wasn't always the case. The settlement was first known as Deland, after a Kansas family who settled here in 1874. From 1906 to 1909 there was a post office in operation under the name Deland, Texas and it was roughly two miles south of present-day Calf Creek. From 1909 until 1915 the community moved a mile to the north where a storekeeper named Lum Tucker opened a post office in his store. Having filed the application, Lum requested that the post office (and therefore the town) be named after him. 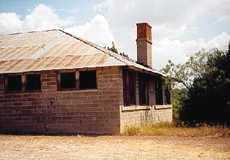 Besides the post office and store, Tucker, Texas also had a blacksmith and cotton gin. 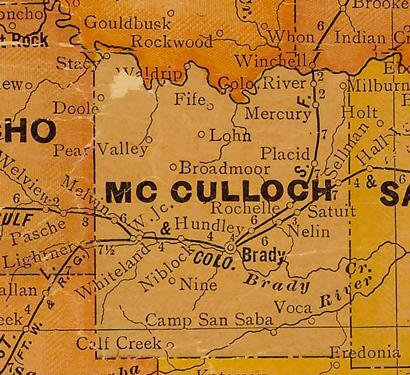 It wasn't until 1915 when the post office moved a mile north and took the name Calf Creek. The creek bed of Calf Creek. The old one-teacher school was replaced in 1921 with a sturdier building with four classrooms. Enrollment leapt from 21 students in 1898 to around 100 by the early 20s. It merged with Brady schools in 1949 when the population was reported as 50. School consolidations drew families away from the smaller towns - robbing them of their future. 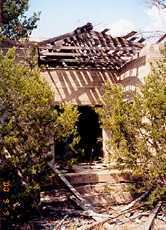 Calf Creek's population declined even further and the last straw was the closing of the post office in 1953. It was down to a mere 23 people in 1990, the same estimated figure on the 2004 state map. 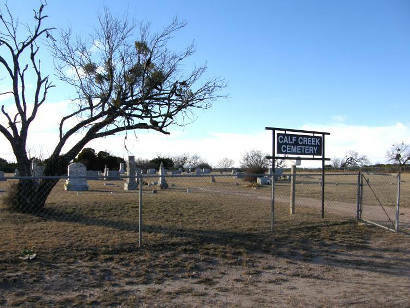 A church and a cemetery appear on county maps and the ruins of the old school sit a half mile west of the highway. 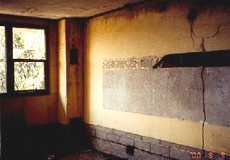 A classroom with the floor and blackboards missing. "The road that runs west to the school." 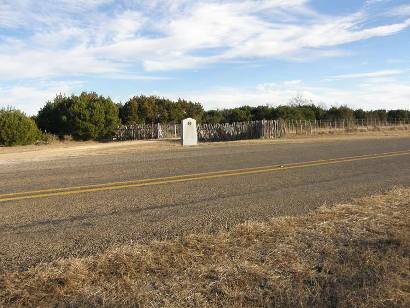 The marker on FM 1311 one mile south of Calf Creek. I have researched and written on this subject since about 1974. That battle occurred in 1831. There were no "settlers" in that area until 1878 when my ancestor moved to the area. 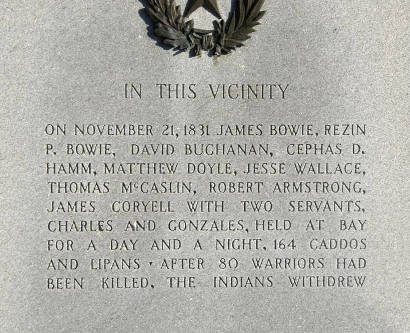 The battle came about when James Bowie, leading an expedition consisting of his brother Rezin, eight other men and a boy, attempted to separate the local Indians from a cache of silver which Bowie believed the Indians possessed. He was besieged by approximately 124 Indians, (his own words from a written report). 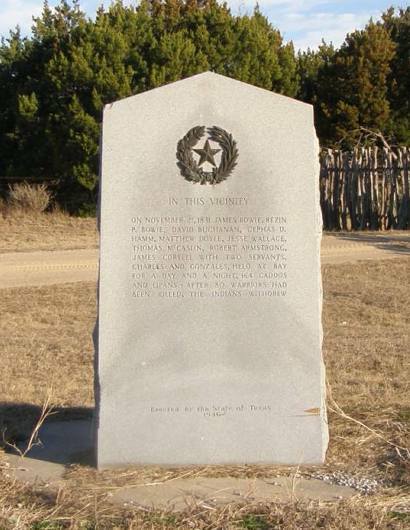 The expedition eventually escaped and returned to San Antonio suffering one fatality and several wounded men. A complete and detailed account of the battle and circumstances related to it both before and after the battle is available at www.calfcreek.net/bowie.html .